I have a question: I burned my glass enclosed green candle as far down as I can. I can not light it anymore as the lighter won’t reach that far. How do I dispose of this candle? I am going to surmise that one of two things were happening to your candle; either you kept putting it out every day or it went out upon initial lighting and you kept re-lighting it. 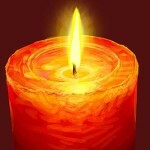 First, we will rule out any physical problems that the candle might have. If the wick did not ‘float’ over to the side of the candle glass, the liquid wax pool did not ‘drown’ the flame, too much oil was placed in the candle, or there was no sudden blast of wind, then we can rule out tangible facts that led to the candle going out. If the candle went out on its’ own, then the spell is done. If you were extinguishing the flame with a candle snuffer, only to relight the candle when you return, this is fine for continued candle burning. If you were using your breath and blowing the candle out, then the candle burn or candle spell is DONE. Why? Because your ‘essence’ or ‘ache’ (spirit) was ‘mingled’ with the wax or was ‘introduced’ to the candle wax and flame, and in essence, your ‘spirit’ willed it to be ‘out’. To continue to burn a candle specially prepared for candle spell magic after blowing said candle out is fruitless; magic will not happen anymore. The same DOES NOT hold true for the scented candles we burn for fragrance use only (Yankee Candle and the like) The intention of these types of candles if for scent or fragrance only – so no harm blowing these outwith your breath. In regards to disposal, I place all glass candles in the recycling – unless used with free standing jumbo tapers for the same intention. Do not mix intentions and change out the pull out candles for different conditions. Keep money drawing together, reversible together, etc.